Continuing with DIY T Shirt Dress project here is another one where target is those famous dress from 50 style. 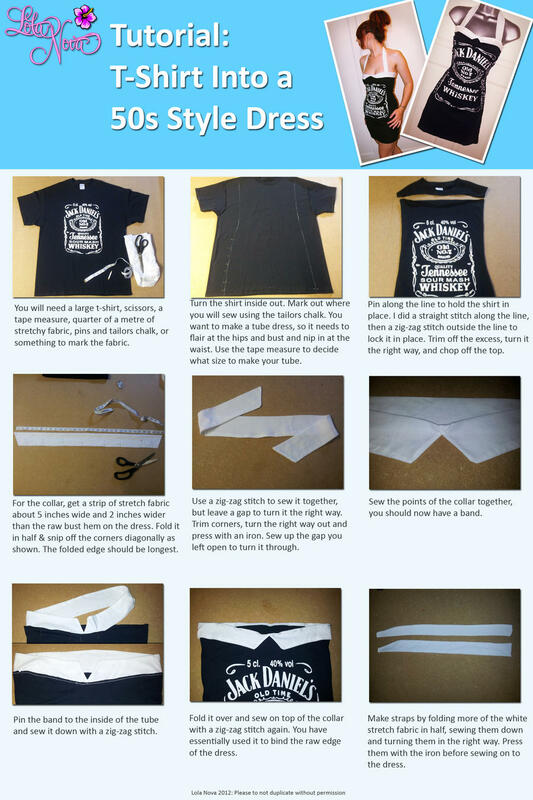 It also another interesting and fancy way of remodeling old t shirt. I think you will share the opinion that when it comes to wearing dress is more nice when the dress is more comfortable and cozy if it is 100% cotton. So for me this kind of DIY T Shirt Dress projects is full hit, you are using old t shirt, it is comfortable and you are getting new chick piece to wear. DIY T Shirt Dress From 50s Project needs: one t shirt, scissor, ribbon (about quarter of a meter of stretchy fabric), sewing machine, and tape meter,pins and chalk. So the steps for making this dress from 50s are shown on the picture bellow. First step is to turn inside up the t shirt and draw the lines to form a dress, measure your dimension and add a little bit more on both sides, or other solution is to take some real model and put it on it and draw by the edges as we already done in some previous projects. In this project we are going to make tube dress so it is a bit flair to the hips. And connect them as is shown on the picture bellow. Sew the points of the collar together to get a band. Add this at the top of the dress. Pin the band inside of the tube dress and sew it down with a zig-zag stitch.Folded over and sew it on the top of the collar again. Make the measure for the shoulder strap from and cut two equals parts and sew each on the both sides so you get the v look connecting on the neck. Credits for this DIY T Shirt Dress from 50s Project goes here.